Tag line: "How do you kill something that won't die? Where do you run when they're everywhere?" The Dead Next Door has the look and feel of a school project, a horror movie made on the cheap, with more than the occasional nod to the films (and filmmakers) that inspired it. It's also jam-packed with excitement, and one hell of a lot of blood. Large pockets of society have succumbed to a virus that brings the dead back to life, and it's up to a small band of commandos, called The Zombie Squad, to find a cure. Led by Raimi (Pete Ferry), The Zombie Squad sets out from their base in Washington, DC and travels to Akron, Ohio, where it's believed the virus originated. Well-armed but short on manpower, the commandos must fight off hordes of zombies, as well as an overzealous cult, under the leadership of one Rev. Jones (Robert Kokai), that's determined to “protect” the rights of the walking dead. 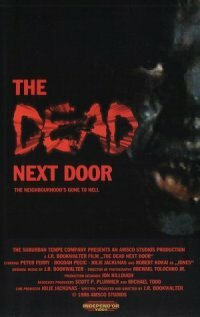 The Dead Next Door winks at its audience continually, acknowledging horror's great history by way of its characters (apart from the lead zombie hunter, Raimi, there's Dr. Savini, Commander Carpenter, and a handful of others) and situations (the living dead walk into a video store, where one tries to check out a copy of George A. Romero's Dawn of the Dead). Though they did often bring a smile to my face, some of these fan-boy references were a bit of a distraction. But not to worry: The Dead Next Door doesn't dwell on them for very long. Right out of the chute, The Dead Next Door is in full zombie mode, delivering plenty of carnage before its story even has a chance to kick into gear. And when things do finally start rolling, the film only gets crazier. Early on, the Zombie Squad is checking out a house for signs of the living dead. Richards (Scott Spiegel) follows a trail of blood up some stairs and into a room, where he finds a zombie chewing on a young boy's remains. He's able to cut the creature's head off, but even that doesn't kill it, and before Richards knows what's hit him, the thrashing head has bitten off several of his fingers (leading to an impressive effect when the head swallows them, and the fingers pass through its throat and fall onto the floor). But this is nothing compared to what happens later on. Where else but The Dead Next Door are you going to be treated to a zombie, his vocal cords attached to a synthesizer, belting out a rendition of "The Star Spangled Banner"? The Dead Next Door does have a few rough edges, but if you can look past the misplaced humor and poor acting, you'll find an entertaining film with a number of good ideas. I liked it a lot.